I have been tracking this movie since its inception and I have been incredibly pumped about it. Seriously. Like really really looking forward to this movie. When, I first heard that the numbers weren’t going to be strong for it, I was disappointed because well this movie sounded like it would be a Blockbuster hit and for some reason it wasn’t being predicted as such. It was what I wanted Transformers to be and that movie was playing every half an hour at my theater, but for some reason this movie had only two show times, which is very concerning. Despite this, I recommend you check this movie out. THIS, will be a movie I buy, especially if the director’s cut includes more robot fighting. 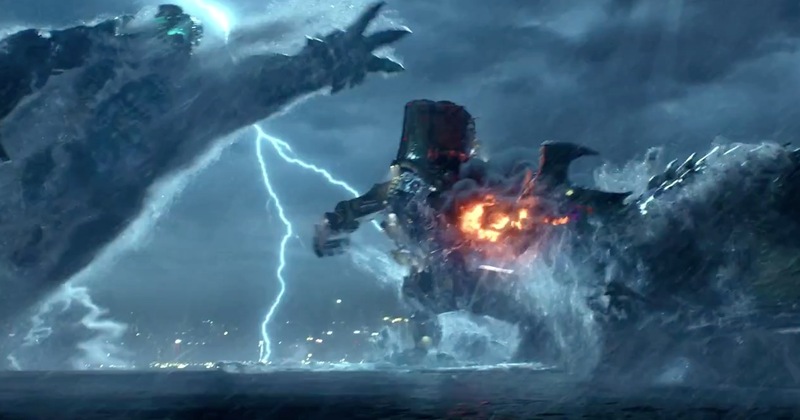 “Pacific Rim” tells the story of David vs. Goliath where instead of David hitting Goliath in the head with a stone and a slingshot, he gets a whole bunch of people together, they build a massive robot, equipped with swords and a plasma cannon, and then they murder Goliath and all of his family. The story begins with a montage courtesy of Charlie Hunnam playing Raleigh Becket. Raleigh tells the story of how monsters emerged from the Pacific and began destroying the major cities of the world. Not one to back down, the human race bands together and created the Jaeger program which is German for fighter. These huge machines battle the monsters in order to keep the rest of us safe. Raleigh is an ace pilot with his brother Yancy Becket, played by Diego Klattenhoff from “Homeland”. Two individuals need to pilot a Jaeger because the human brain can’t synchronize with the robot all by itself. The best fighters are the ones that have the best drift, meaning that they think the same and react in the same way. The story jumps forward to a point where the Jaeger program is being decommissioned because nobody has any money anymore and a giant wall just appears to be a much better idea. Stacker Pentecoast, Idris Elba, asks that Raleigh return to the Jaeger program in order to have one last battle to save humanity once and for all. Raleigh, without a partner, meets Mako Mori, played by Rinko Kikuchi, who he feels in instant connection, drift compatibility, and wishes to pilot his old Jaeger Gypsy Danger with, much to the chagrin of Marshal Pentecoast. The research department consisting of Gottlieb (Burn Gorman) and Newton Geiszler (Charlie Day) believe that a dramatic last stand might not be the best way to defeat these creatures and Newton, AKA Newt, believes that the Kaiju are smarter than the humans think and enlists the help of Kaiju dealer Hannibal Chau (Ron Pearlman) to learn about the creatures in more detail. There are a lot more characters and Jaegers, but I don’t want to spoil anything for you. In total, this movie was amazing. The fight scenes were fun, the action was great, the acting was a bit clunky. I’m not sure how Guillermo Del Toro chose Charlie Hunnam or why really because he wasn’t that strong of an actor. There were a lot of flubs and missteps I felt throughout his scenes that could have been better and stronger. I also get a little sick of his Jax swagger that he always walk with. I’m not sure if he has a condition or something and must constantly bounce upon his feet but seriously that man walks like he wants everyone to know how legit he is. Idris Elba held his own in this film all the way up to his great cancelling the apocalypse monologue. I believe he had a great gasp on his character and that came through completely well. He was strong, stoic, and commanding. Not a lot to ask from an actor as good as Elba, but he still hit the nail on the head. Charlie Day was alright in this film, again, he too suffered from some missteps and clunkiness. I felt like he understood the character but his delivery was off. Some of his scenes were great, especially the ones with Ron Pearlman, but the scenes he shared with Hunnam could have been better. Despite the acting glitches, this movie was beautiful to watch. The computer generation was fantastic and brutal, portraying the Kaiju’s teeth breaking while the Jaeger’s arm was getting ripped off. A lot of it was also quite upsetting. These battles often occurred in a very slow and heavy motion and when things went wrong, they were jaw dropping. The same can be said for when things went write. The only thing I ask of this film is to see more Jaeger fighting the Kaiju. That’s all I ask. I’m hoping the rumors are true that the director’s cut will have more scenes like this and, if this is so, I will definitely be buying it. Please check this movie out I assure that it is much better than “Grown Ups 2” and it is completely worth it.